RALEIGH— A dam on the Neuse River that some say causes hazardous conditions in the water could be removed. Another proposal has been made to take down the Milburnie Dam, near where two children died this summer. While some feel the move is necessary to make the Neuse River safer, not everyone agrees. It’s a view Reginald Lee says allows him to escape the stresses of the day. Lee describes it as “serene and peaceful.” The 16-foot Milburnie Dam was built on Neuse River in 1855. It has become an attraction for fisherman who use the river, but John Preyer with Restoration Systems believes it is time for the man-made resource to go. “It creates a number of conditions behind the dam in the impounded state including the dissolved oxygen which is bad for fish, bad for mussels bad for everything that’s in the water,” said Preyer. Restoration Systems submitted a proposal two years ago. However the Army Corps of Engineers denied it because they did not include enough details. Now the plan has been revisited after they turned in another one. Their main goal is to restore the river back to its natural state. “We’re going to generate stream mitigation credits which are going to be used within the Neuse River basin to offset stream destruction,” said Preyer. Lee hopes the plan to bring down what he calls a community landmark gets washed away. “It’s been here it’s stood the test of time why bother now?” said Lee. Preyer said the conditions on the river are deceptively dangerous. In 83 years, 11 people have died. The most recent, two children this past July. “My heart goes out to the families who lost their loved ones but at the same token, it’s not the dam’s fault,” said Lee. There will be a public workshop on the dam removal project Dec. 6. Restoration Systems expects to issue permits some time next year. They are removing it for credits so they can destroy habitat in another location. Restoration Systems is not destroying habitat in any other locations. Mitigation credits will be produced from this removal to be sold to DOT, developers, etc. to offset development within the Neuse River basin. So those credits are not used by DOT, developers, etc, to destroy habitat but to improve habitat and RS doesn’t make a profit doing this? I was stating that Restoration Systems will not be destroying habitat in another location. If DOT builds a road and cannot avoid mitigation, they will do everything to minimize it and then have to mitigate for it as will developers. Whether they come to a private bank or pay the state, the development will be done. When they purchase from a private bank, the mitigation work has already been performed. 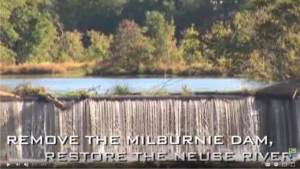 The Milburnie Dam Removal & Neuse River Restoration is a project of Restoration Systems, LLC.